Hello from Hamburg. We are finally on our one-month summer vacation in Germany in Portugal. It feels really good to be back home, although Hamburg is not my hometown (I went to university in Berlin). I love summer in big cities. Life is happening outside. People take every opportunity to get some much-needed sun rays. On every available little strip of green, people spread out their blankets to enjoy some fresh air with a little portable BBQ or picnic. You'll find queues in front of ice cream parlors. Beer gardens are bustling from mid-afternoon on. The combination of big city buzz and peaceful outdoor relaxation is what I like. As you walk past, you overhear other people's conversation. A real slice of life. Something that I have always missed in Dubai. I am in holiday mode. For one month, I will loosen up a bit about my self-imposed dietary restrictions. We are staying at other people's houses. Sticking to a grain free or gluten free diet, I would have to go the extra mile. I am not willing to do that. I enjoy a cold beer in the afternoon or evening. I also would not want to miss the delicious breads that are available in Germany. Staying mostly sugar free, will not be such a big issue, although I will surely indulge in the occasional ice cream. But I have come prepared. For the past few weeks in Dubai, I have cooked up storms and taken lots of pictures that I have taken a long. So while I am indulging, there won't be a shortage of healthy recipes for you. Today's recipe is a refreshing drink that I made almost daily in the past few weeks in Dubai when temperatures were soaring: my Cucumber Lemon Cooler. I love the combination of cucumber and lemon, as the cucumber cuts the acidity of the citrus, which is otherwise done with a lot of sugar. Some mint adds some extra freshness. The result is a refreshing low-calorie drink that is made from fresh and raw ingredients only. Enjoy your summer! 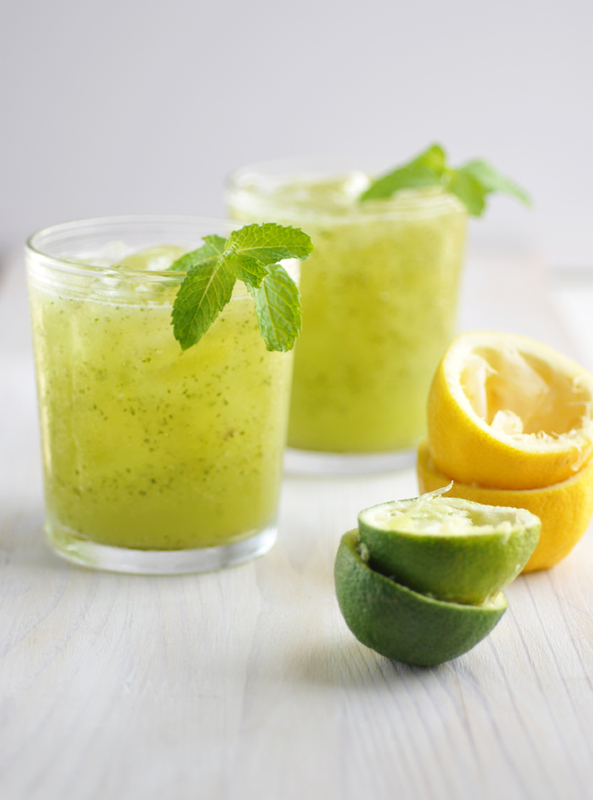 In a high speed food processor, combine cucumbers, mint, lemon and lime juice and water. Blend mixture until smooth. Transfer to glasses. Stir in honey and top with crushed ice. Garnish with mint leaves. Serve immediately.